The Blackberry Playbook is finally being released in the United States on the 19th of April after many months of increasingly tiresome speculation. 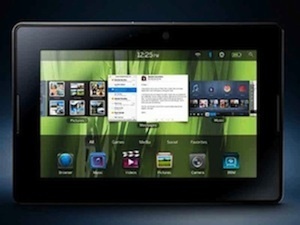 The Playbook will be the first such tablet device from Research In Motion. The Playbook should, considering some of its specifications, be a reasonable enough contender in the marketplace, yet Research In Motion have taken what appears to be a worryingly slapdash approach to some of its features – namely, native applications. It seems that on the 19th of April, US consumers who buy the Playbook will be doing so without any native applications such as calendar, contacts and even email, a situation that appears so bizarre, if not downright stupid, that it is difficult to really understand what could be going through the head of the top brass at Research In Motion, in order to get them to approve such an approach. What is customer satisfaction anyway? We’re not talking about fancy applications that look good but most people don’t ever really use. We’re talking about standard, absolutely essential applications that no such device should enter the marketplace without incorporating. There is a way around this situation, apparently, in that you can tether the Playbook to your old Blackberry Smartphone and get those apps that way – but who the heck wants to do that for a brand new device that should have these things on it as is? And what about those people who don’t have a Blackberry Smartphone already? They don’t even get to have an email service on their sparkling new tablet? It has to be said, because we doubt we’re going to be the only ones who think this is a poor move by RIM.